Oh y’all…oh oh y’all. We have two new puppies. And two HAPPY little boys. Working from home is suddenly not as peaceful. Pray for me and my attitude about these puppies. I know boys need puppies so here we go . . . While I am dealing with the puppy chaos, and dreaming of our North Carolina mountain trip in two weeks, I am going to repost this fall West Elm post from last year. 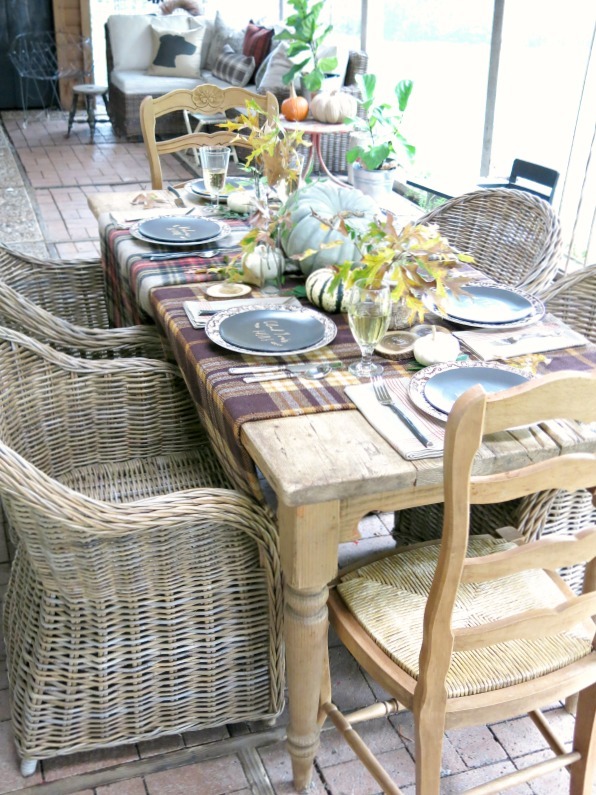 West Elm sponosored this great “Gather Around the Table” last year and it was fun to style with some of their goodies…and yes these photos do make me miss my old backporch just a bit. Last but not least the “Gospel is Peace” sign pics are for you my dear friend Hadley;…remember you can get these great signs from my friend Lindsey Letters…I have been getting some emails about them and all you need to do is visit her great site! 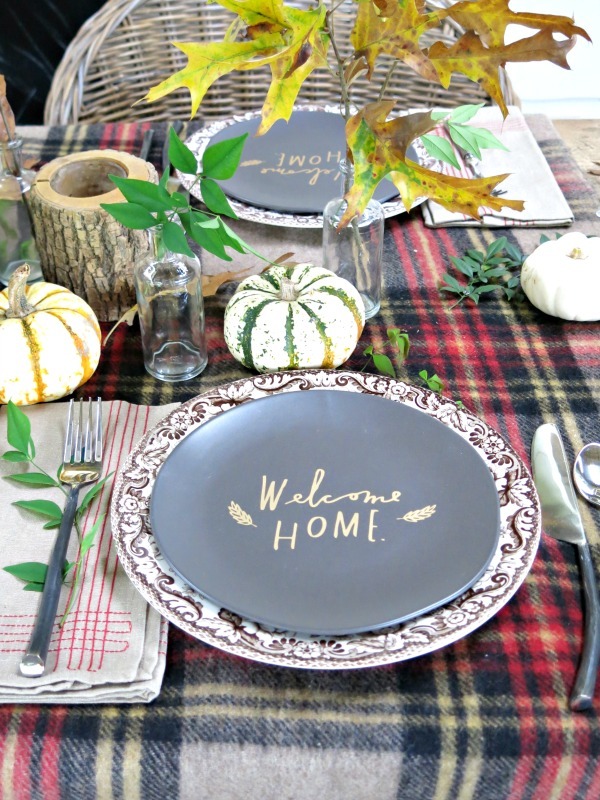 I am so excited to be a part of the Gather Around The Table campaign being sponsored by West Elm. They have asked bloggers to talk about their traditions and favorite things about the holidays and share how they incoprorate some of their products with those traditions and ideas. I visited the West Elm Market store in Brooklyn in the Spring and was so impressed with the store and products. 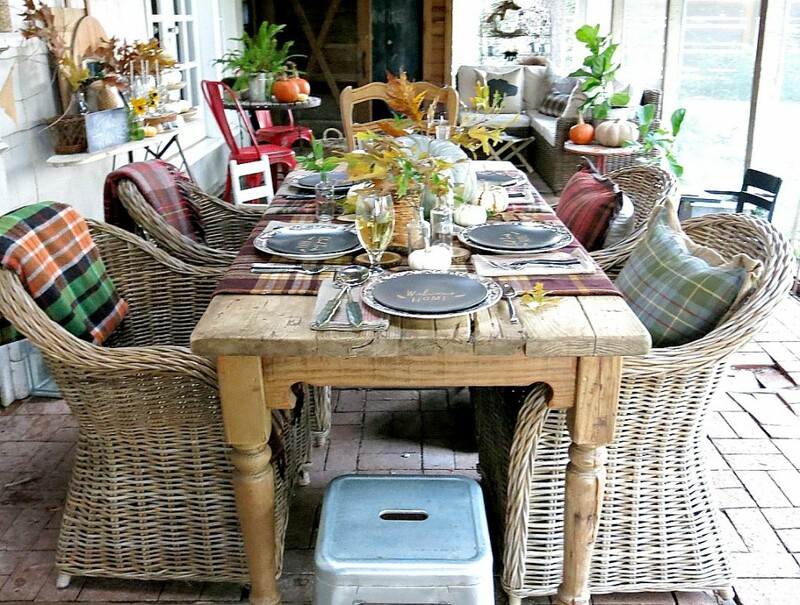 In South Texas, we often have warm weather off and on throughout the fall so dining on our porch is a wonderful tradition this time of year. We are finally getting a break from the heat down here and its a great time for my family to enjoy this space in our home. 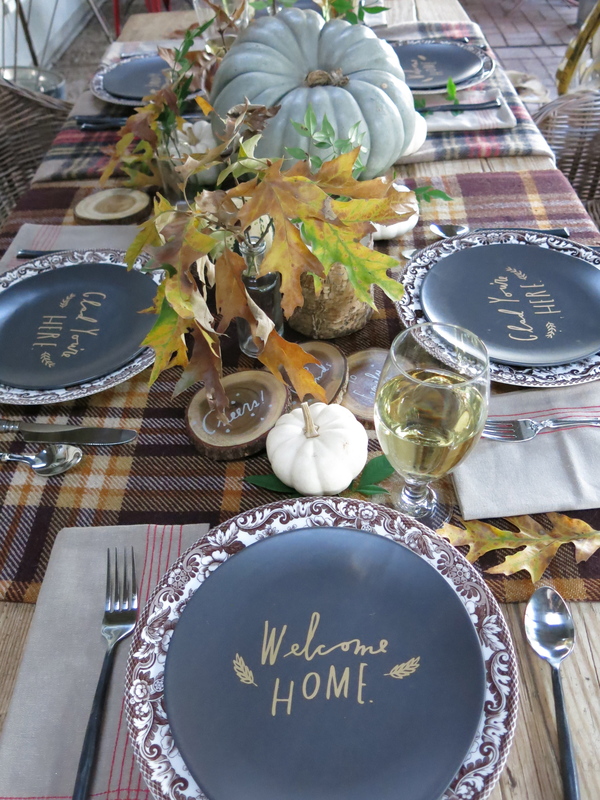 So along with the leaves and pumpkins, I decided to use Shanna Murray plates from the West Elm collection with my Spode plates. I like the idea of using something traditional, something we always use, with a fresh new accent from a more modern store like West Elm and West Elm Market. In case you don’t know, West Elm is the hip cousin of Pottery Barn; Or at least that is how I see it…their products are bit younger and more modern…but they mix well with many things. AND I love that they support and feature a lot of etsy artists including Shanna Murray. I was so pleased to see these Shanna Murray plates (and coasters) in their collection and her cute teal towel in the West Elm Market. I have been following her work for years! The napkins are also from West Elm’s fall collection, I love the red stitching. My mom often used cloth napkins when I was growing up and I love doing the same. Not every night I admit but often. And these have a casual enough feel they work with my pine table. 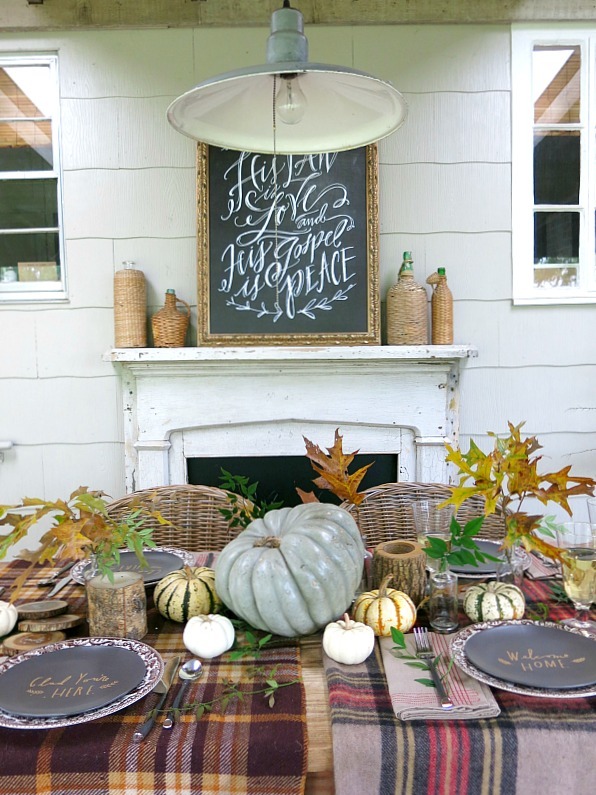 Speaking of pine tables, I have rustic farmhouse tables both outside and in our dining room. 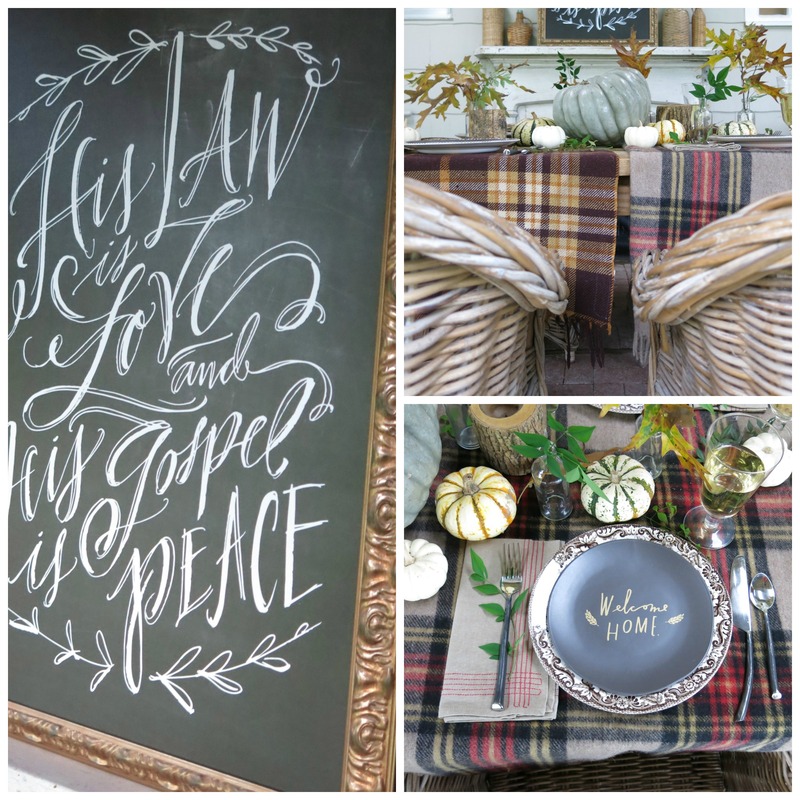 I love the patina and finish of the wood so I rarely if ever use tablecloths or even runners, these plaid blankets from the Brown Shed worked great to add some warmth to this table but not totally cover my beloved pine. These old tables are a part of our family traditions as well as daily life. I love that my kids are using old items daily and are engraining a sense of history into their “growing up”memories and traditions. 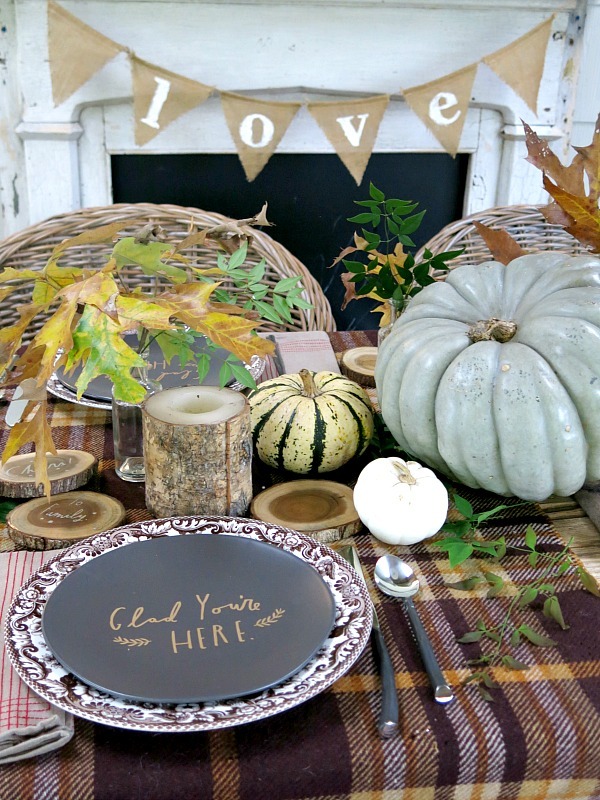 I am also adore how the Shanna Murry plates and West Elm napkins are working with my other fall decorations I already had like my burlap banners and also my new Lindsay Letters canvas. I love to change it all a bit each time so it’s great it all mixes well. My new canvas is really for Christmas, its a verse from Silent Night, but I think words are perfect for fall and Thanksgiving too..being grateful for those we love and gather with to count our blessing and remember what is truly important. It used to annoy me how the seasons mingled this time of year. 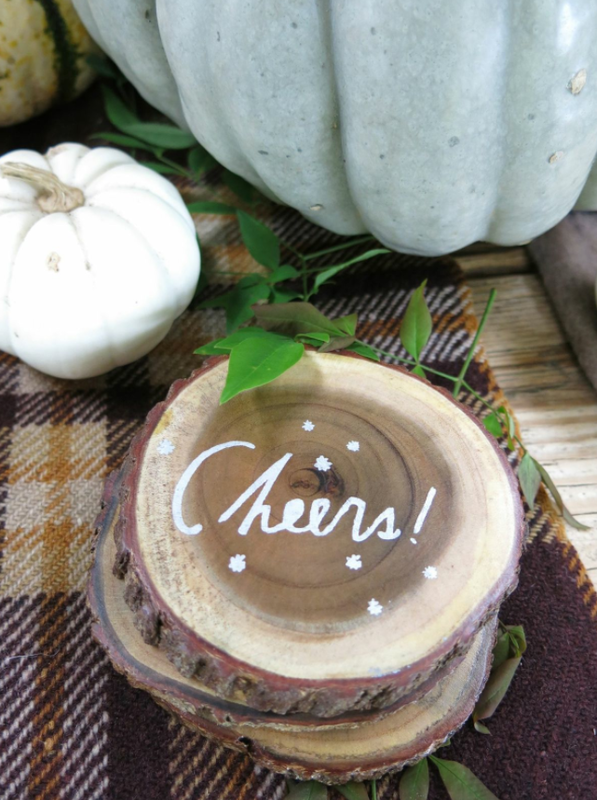 More and more I am okay with it as I understand the joys of fall and gratefulness and how that all CAN and SHOULD mingle with the coming celebrations that are the core of our faith and our family. 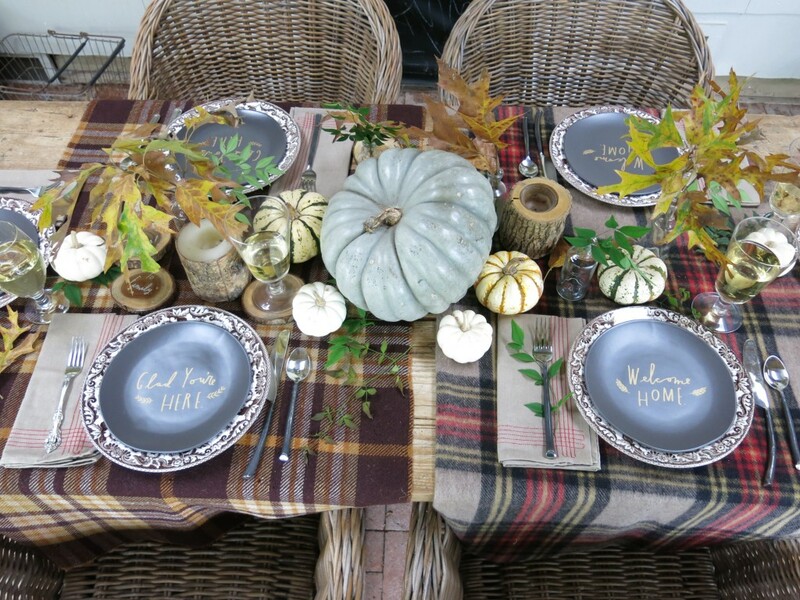 I will be back to share a few more of the fall touches on the porch…and later in season I will share another festive table setting. 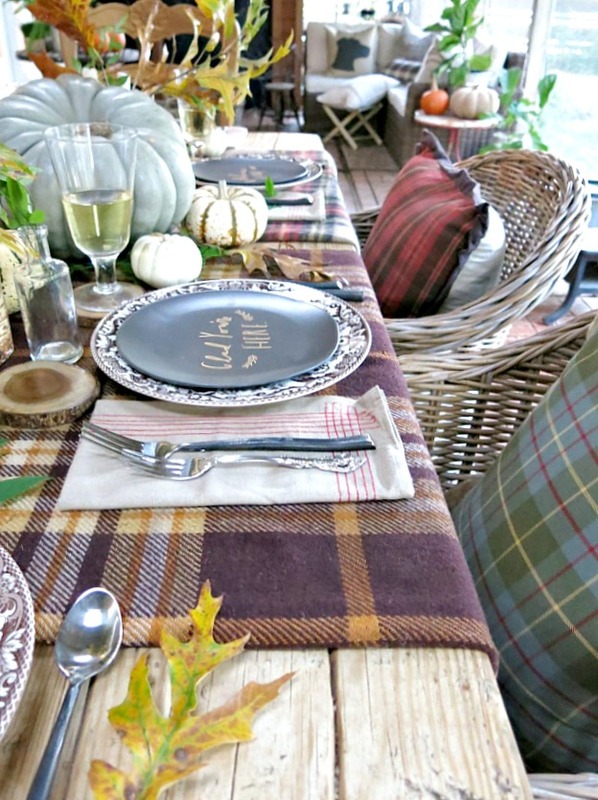 Thanks again to West Elm for sponsoring today’s discussion on fall decor and traditions. 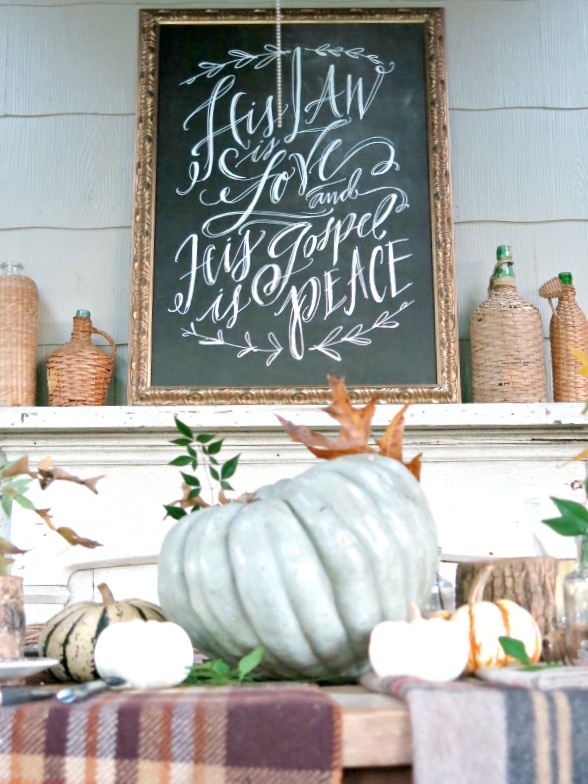 What is your favorite tradition or thing to use in decorating this time of year? OK Holly, buckle up for a wild ride with those pups! I have followed your blog forever and feel I have some (hopefully helpful) advice for you. 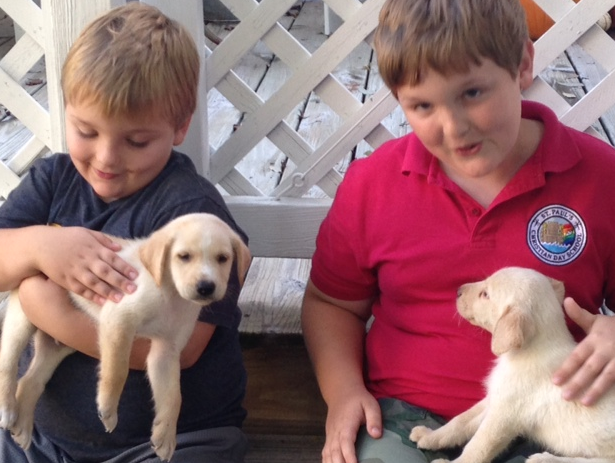 I have 2 boys, ages 6 & 9, and we just got a puppy 7 weeks ago. Firstly, please realize that you will need to summon all of your patience to get through the next couple of months, like, for real. Caring for a puppy(ies) is exhausting and it will have you questioning your decision to do so! Our puppy has gotten into literally everything. My suggestion is to roll up all possible rugs, puppies love to pee and chew on them. Get lots of appropriate chew toys to use for redirection: ropes, balls, nylabones, NOT rawhides(they can be very dangerous if swallowed). Whoever is getting up throughout the night to take the dogs out will be exhausted, so remember that when interacting with your hubby 😉 Have a designated place for the puppies to spend time when you need to get things done, we bought a flexible dog pen for indoor use, it has been a lifesaver! Other random stuff: keep an eye on cords to lamps, baskets, furniture, etc. because they are magnets to a puppy’s mouth! Most importantly, make the boys interact with the puppies as much as possible. Nipping will probably scare your boys away at some point but encourage them to play with their dogs daily. Our pup, Daisy, is listening better and better everyday!!! Good Luck!! Oh, how precious! I actually miss having a puppy in the house…I have an almost 3 year old golden retriever that we brought home at about 8 weeks. It was definitely hard work in the beginning but SO worth it! My boys were 8 and 6 at the time and I love that they will grow up with her. If you need extra support, (or a few laughs), read my “Weekend Pupdates” where I documented the first year of her life. It sure was an adventure! Good luck with yours! The puppies look precious, and I know your guys will have a full heart with them! Yes, you ARE going to have chaos. But “this too shall pass.” So wish I could be going on a NC mtn. trip in two weeks. The fall colors may still be very good then. (They had done nothing in the southern part of the state as of last weekend.) Loved this post from last year and enjoyed it all over again today. 🙂 What are the puppies’ names??? This is so inspirational. I absolutely LOVE (and NEED) those blankets! Perfection! Thank you for sharing. Like your banner says LOVE this setting!